For years I felt haunted by a persistent inner voice that told me I was meant to do more with my life. Although I earned a good living and enjoyed the company of family and friends, I felt restless and unsatisfied. There was so much I wanted to do with my life but lacked the courage and confidence to take action. At the prompting of a good friend who referred me to her therapist, I finally reached out for help. As I sat in his office waiting for my first appointment, my eyes stopped at a cartoon hanging on the wall. It was Snoopy, Charlie Brown’ s dog from the Peanuts comic strip, struggling to balance a doghouse on his back. The caption below the cartoon read: “There’ s nothing heavier than the burden of potential.” As I stared at that message I started to cry. I too felt burdened by my unrealized potential. I was bursting with energy and desire but lacked the skills to channel it in the right direction. Once I realized that I could release this burden by taking specific actions to build my confidence and self esteem I got to work. Using the gift of guidance and a whole new action plan, I set about making the changes that allowed my true self to emerge. With each tough choice and courageous step I slowly learned to trust and act on the wisdom of my inner voice. As I did, my life began to change in ways I never would have imagined. Yours can too. In this book I’ ll offer you a step-by-step plan to unlock and use your greatest potential. As you do, you’ ll not only give birth to an amazing life, you’ ll be given an opportunity to help others do the same. To begin, you need only consider the possibilities . . .
What would your life be like if you had the courage and emotional strength to overcome self-doubt, fear, or concern for what others say about you? Think about it. How would your relationships change? Would you stay at your current job? Are there any big moves you’ d feel liberated to make? How would your life be different? I understand these yearnings. For years I let fear and self-doubt rule my life, too afraid to step out on my own and follow my true desires. I designed my life according to the blueprints of others. I made people-pleasing a full-time career, trusted the advice of friends before my own, and sabotaged my success each time I came too close to doing something other than what others thought I should do. It wasn’ t until I faced the truth of how attached I was to the opinions of everyone else that I realized how clueless I was about my own. You have deep within you the power to fulfill your highest vision of your life. To engage this power you must develop a solid personal relationship with yourself. By doing so, you’ ll tap into a wealth of inner strength that will allow you to take the necessary actions that build confidence and self-esteem. When you learn to stop hiding your power and use fear to your advantage, you’ ll become less attached to what others want for you and more attached to what you want for yourself. As this shift occurs,you’ ll naturally begin to lead a more authentic and passionate life. ____ I have responsibilities that prevent me from doing what I really want. ____ Though I schedule time for myself, I often end up canceling it to accommodate someone else’s needs. ____ I tend to care too much about what others think of me. ____ Each time I get close to success, I do something to sabotage my progress. ____ When faced with any decision, I immediately call several people for input. ____ I often say yes when I mean no. ____ I take things personally and feel easily affected by others. ____ I feel like I’m not living up to my fullest potential. ____ When speaking with others, I often downplay my knowledge to avoid seeming arrogant. ____ I’m afraid to out-succeed my parents. ____ I have a nagging sense that something is missing from my life. ____ When I’m upset with someone I’d rather talk myself out of it than confront the person with the issue. ____ I have a secret desire that I’ve never admitted to anyone. ____ When someone neglects to follow through on a promise, I quietly brood and do it myself. ____ I long to find my passion or purpose in life. If you’ve checked off even one of these statements, read on . . .
Over the last several years I’ve listened closely to the needs of my readers. By talking with them during live workshops, communicating electronically with my on-line community, conducting teleconferencing discussions, and leading the Lifestyle Makeover series for the Oprah Winfrey Show, I’ve met men and women from all walks of life. I’ve seen the epidemic of frustration and despair. How do I learn to speak up and honor my needs without feeling selfish? Where do I find the courage to make the changes I know I need to make in spite of the reactions of others? How can I overcome the self-defeating behaviors that make me feel stuck? Is there a way to set boundaries without damaging my relationships or feeling guilty? How can I stay motivated and stop sabotaging my success? How do I find my life purpose — some kind of meaning or direction for my life? These questions represent the inner challenges we all face as we attempt to find satisfaction in our lives. In my first two books, Take Time for Your Life and Life Makeovers, I offered practical strategies that allowed readers to begin reclaiming their lives. By practicing the basics of good self-care and tackling those areas that were causing the most stress — cluttered environments, poor financial health, or nonstop, draining to-do lists — many of you joined me in a plan to take more control of your lives. As you set about making these outer changes you may have bumped up against inner changes that needed to be made as well. For example, you may have wanted a way to deal with your guilty feelings as you made your needs more of a priority. Or you may have needed a strategy to handle your fear as you took bold steps to pursue a lifelong dream. Maybe you felt incapable of handling the inevitable conflict that would occur as a result of making a decision to take control of your life. ARE YOU GIVING UP YOUR POWER? When you decide to improve the quality of your life you set in motion new relationships with yourself and others. As you start to take better care of yourself there’s a good chance that you’ll feel uncomfortable at first, and that some of the people in your life will feel threatened. For example, if you’ve always said “yes” to family members who need your help, when you start saying “no” it will ruffle some feathers. If you’re used to putting the needs of your children before your own, you will feel guilty when you start to make your needs more of a priority. When these reactions to your newfound commitment to self-care occur there’s a good chance that you’ll do what most caring people do — back down to avoid conflict, hurting others’ feelings, disapproval, or abandonment. Most of us play it safe by putting our needs aside when faced with the possibility of feeling guilty, disappointing others, or facing conflict of some kind. At home you may abdicate your need for support with the kids to keep peace with your spouse, letting your resentment build over time. At work you may allow a complaining coworker to keep draining your energy to avoid confrontation — and end up hating your job. Or you may go right back to saying yes to family members who give you a hard time to avoid their emotional rejection, only to feel frustrated by the lack of quality time that you have for yourself. We work hard to manage the perceptions of others, ignoring our own needs, and in the end we surrender the very thing that will allow us to live authentic, meaningful lives — our power. Don’t get too big for your britches. Be seen and not heard. Put the needs of others before your own. Keep peace at any cost. Don’t out-succeed your loved ones. Don’t threaten others by being too bright. Don’t toot your own horn. Don’t be too proud of yourself. Don’t be so full of yourself. Instantly I felt the emotional hit in my body and turned just in time to see the young boy shut down too. He dropped his head and started to walk away. My friend meant no harm by his comment; it simply reflected the rule he had been taught to follow: Don’t be boastful. By teaching our children to stay in line we create well-behaved followers. While this may make parenting a bit easier, it has enormous costs later in life: These same children grow up to be unhappy adults who desperately want to lead their own lives, yet lack the necessary skills to do so. Stop apologizing when you’ve done nothing wrong. Be proud of who you are and what you know. When I think about how my life might have been different had I been raised with these types of rules, I know I would have spoken up in school when I knew the answer to a teacher’s question instead of feeling too insecure to raise my hand. I would have performed in the high school plays that captured my imagination rather than relegating myself to the audience secretly longing to be on stage. And as I grew older I would have had the courage to leave the relationships that wounded my heart instead of sticking around, desperately trying to be “good enough.” I wonder what you would have done differently? Would you have taken more risks, allowed yourself to stand out from the crowd, or used your talents instead of keeping them hidden? Owning our talents and gifts can feel like a risky proposition. When we speak up for what we want and take the actions to make it happen, others may react in a hurtful way. For example, your best friend may get snippy as your new job makes you less available. Or your mother might become emotionally distant when your happy marriage reminds her of what’s missing in her own relationship. As we start to out-succeed our loved ones our discomfort with success heightens. We become a target when we have something others want. Rather than rocking the boat and being faced with hearing the question “Who do you think you are?” we settle into a semicomfortable relationship with dissatisfaction. It’s much safer to be needy. When my husband left me for a younger woman, my friends instantly rallied to support me during my divorce. They came to my rescue, made meals, and talked with me late into the night. Two years later, when I had recovered emotionally, lost 30 pounds, and received a big promotion at work, these same friends began gossiping behind my back about how “full of myself”I’d become. I had changed. I was stronger,more confident, and a lot less needy. I guess they couldn’t handle it, but that didn’t make the hurt any less painful. It can be a confusing and tense time as we struggle with the emotions that erupt around another’s success. How do we deal with the complicated feelings of envy and joy or the fear of being left behind? I can still remember the discomfort I felt as I watched my friends achieve the kind of goals I wanted for myself. On one hand I felt happy for their accomplishments, and on the other, jealous of their success. I felt confused and embarrassed by these feelings. Over time I learned to see them as an indication that I needed to grow in some way. For example, I began to understand that my jealousy was a signal that there was some action I needed to take to move my own career forward. My fear revealed a belief that there wasn’t enough success to go around. As I worked through these issues and followed the journey that I’ll now share with you, I ignited my passion, and my career began to take off. Soon I found myself on the other side of the equation. As I started earning more money and achieving the success I desired, I felt uncomfortable talking about it in the company of some friends. Up until that point, so many of our conversations revolved around what wasn’t working in our lives, and suddenly I didn’t have a lot to say. I knew how to talk about my dissatisfaction, but I had no experience in talking about my success. I was afraid that sharing my accomplishments might appear boastful or spark feelings of jealousy and competition (the same feelings I’d felt before). So I let others do the talking. And when I felt really uncomfortable, I even found myself looking for what wasn’t working just to level the playing field. How you choose to respond to the reactions of others has serious consequences. When my client Kate decided to make her needs more of a priority, she asked her husband to take on more responsibility at home. The mother of two small children, Kate worked full time and handled most of the household chores. After complaining about the inequality at home and getting the cold shoulder from her husband, Kate made the decision to keep silent. Instead of causing a fight by challenging her husband’s response, she acquiesced and continued to manage their home. But over time her choice to remain silent had enormous costs. She became increasingly irritable with her children, her neck grew tight, and her back hurt constantly, and little by little her growing resentment whittled away at the intimacy in her marriage. Another client, Carol, a medical researcher for a biotech company, was considered one of the best problem-solvers in the organization. Whenever her colleague Michael got stuck with a project, he took advantage of her reputation by turning to her for advice and taking credit for the result. Over the years Carol had simply ignored his need to take ownership of her ideas, but this time, after coming up with a successful new way to test a drug and sharing it with Michael, she was furious at him for suggesting to management that he had discovered the procedure. Though Carol wanted to confront this act of betrayal, she lacked the courage to do so. When she came to me for help in finding a new job, she soon realized that she needed to find her courage first. If Carol ran from this situation without learning to speak up for herself, the problem would only follow her to the next position. Sometimes, the way in which we give up our lives to others takes a different form. Rather than keep silent or make choices in reaction to our fear, we hold ourselves back from the success we deserve by sabotaging our efforts. My friend Chris is a good example. Chris had a masters’ degree in finance and, through hard work, had captured a terrific job in the private banking industry. As his income and professional status grew, his anxiety quickly followed. Chris noticed that family members had started making snide remarks about his upgraded lifestyle. During one family dinner in particular, Chris’s mother made a sarcastic comment about the flashiness of his new car. It was shortly after that that Chris told me that his work habits were shifting. He didn’t feel as excited as he once had and felt he was losing his edge. Chris started showing up late for work and even missed a couple of important meetings. He began to question whether the career he had chosen was right for him. When I suggested that his lack of motivation might have something to do with his family’s reaction to his success, he admitted that he felt guilty about out-succeeding them. His lax behavior at work was his unconscious way of sabotaging his success. When we ignore our feelings and allow others to rob us of self-esteem, or hide our greatest assets out of a fear of becoming the target of another’s jealousy, we commit an act of self-betrayal that has grave consequences. Each act of self-betrayal may keep the boat safely in balance for the moment, but they will severely diminish our self-esteem over time. Ironically, as our sense of self diminishes, we become even more reliant on what others think. As this vicious cycle continues to play out, we slowly lose our passion and desire for life. Filled with doubt and resentment, we eventually face the stark realization that we are living everyone else’s life but our own. You feel disconnected from yourself. The quality of your life has been compromised by your ability to do more and feel less. You’ve lost touch with the very things you need to experience a meaningful life: a strong connection to your feelings and an ability to act on their wisdom. You long to experience a sense of fulfillment and purpose but you’ve centered your life around “shoulds” instead of what you value most. You hide your power. You put yourself down or minimize your strengths and talents by engaging in self-defeating behaviors that weaken your self-esteem. You care too much about what others think. You work hard at managing the perceptions of others to avoid confrontation and feelings of guilt. You allow people to rob you of time, energy, and self-esteem. You allow fear to prevent you from making the changes you really want to make in your life. You settle for less than you deserve. Your desire for instant gratification prevents you from making choices that are in your highest interest. You long to realize your full potential but you stay put because you don’t know where to begin. Your belief that abundance is limited prevents you from supporting the accomplishments of others. You’ve learned to bond with others through suffering instead of success. These behaviors are in place for a reason. When you begin to relinquish your “follower” role, you may feel disoriented and afraid. There’s a good chance that you’ll feel confused about your direction in life. When you stand up for your life, you risk the loss of emotional closeness and camaraderie that you may have shared with family, friends, and colleagues, and this connection is important. The need to belong is hard-wired into our brains. When you develop the confidence and inner security to live your own life, this basic need is threatened. Loved ones, fearing abandonment, may attempt to hold you back by reminding you of the potential pitfalls in your plan. Perhaps colleagues who feel frustrated with their own lack of advancement might make snide remarks behind your back as you move up the ladder at work. When you take the leap you have no way of knowing that in reality, as you honor your needs, your true relationships will deepen and new people will come into your life to replace those you may outgrow. In this book I’ll take you on a journey that will provide you with new “self-honoring” strategies to transform your fear and self-doubt into power. You’ll learn to develop self-trust. You’ll build new courage muscles that will increase your self-esteem. And you’ll develop the confidence to step out into unknown territory so you can realize your greatest potential. As you learn to stand up for your life, you’ll begin to live a life of integrity — a life that makes a powerful contribution to others. Know who you are — build such a strong relationship with yourself that you’ll stop taking things personally and start making choices based on what you want instead of what others want for you—and you won’t think it’s selfish. Define your values — identify your values and the ways in which you and your life need to change in order to center your life around these values. Stop hiding your power — uncover the ways in which you hide your power and eliminate those self-defeating behaviors that chip away at your self-esteem and prevent you from using your full talents and gifts. Stand up for yourself — acquire the necessary skills and language to speak up for what you want and say no firmly and gracefully to what you don’t want. By facing your fear of conflict head on, you’ll discover one of the best ways to build emotional strength — the kind of strength that will serve you in all areas of your life. Build your courage muscles — use fear as your ally by taking more risks and expanding your comfort zone, so you can make the life changes that really matter. Pass up good for great — identify and honor your spiritual standards so you can make wise choices for yourself and your life by learning to pass up good for great. Center your life around your values — take action to make the changes that will center your life around your values. Create a larger vision for your life — share your success with others by committing your life to being of service and by passing on these skills to loved ones, especially children. This journey won’t be easy. By following this path you’ll be making a decision to rock the boat. As you do the exercises and apply the advice to your life, you’ll be sending a message to the universe that you’re ready to challenge your self-doubt and fear of what others think. And believe me, when you make this proclamation, the universe will respond. You’ll be sent the exact people and circumstances you’ll need to develop the kind of “inner security” that no bank account, relationship, or job can ever give you. The truth is this: There is no other way to live the kind of life you long for — one that reflects your deepest desires and allows you to use your greatest gifts — the gifts you’ve come here to share with the world. I know what I value. I tell the truth (even when it’s uncomfortable) and face conflict with grace and confidence. I use fear to my advantage. I trust myself to make choices that honor my highest good. I live a life centered around my values. I support and celebrate the accomplishments of others. 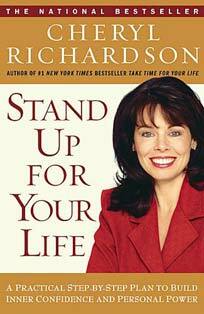 If you’re ready to stand up for your life, you’ve picked up the right book. Before we get started, there’s one more important thing you need to know — your secret to success. The thousands of people who have already joined with others to do the programs outlined in Take Time for Your Life and Life Makeovers could let you in on a secret: The key to long-lasting motivation and change lies in creating a circle of support. As you take the steps outlined in this book you’ll need to surround yourself with others who encourage your choice for change. Standing up for your life will require you to take courageous steps, and a community of supportive people who are committed to their own growth will become your emotional rock — the solid foundation to stand upon until you can stand firmly on your own two feet. After listening to the success stories of thousands of people over the years, I’ve seen the dramatic difference support has made for so many. A high percentage of those who use the power of partnership succeed in making changes that dramatically improve the quality of their lives. After all, it’s much easier to confront a problem in your marriage or to ask for a long overdue raise when you know you have a safety net beneath you. There is power in community. Along with providing the courage to face change, there are other benefits to creating a supportive community for yourself. With smart group guidelines in place that prevent gossip and complaining, you’ll learn to bond with others through success instead of suffering. You’ll experience the richness of moving beyond surface-level chitchat to more intimate conversations. And you’ll make long-lasting friendships that will add more depth and meaning to your life than any material possession ever could. with a trusted family member or friend. Celebrate your success and ask for assistance when you get stuck. When I refer to using your partner or Life Makeover Group for support throughout the program, this may be a good time for you to stop and consider whether or not you could use some extra help. Who are the people who stand in your corner during your most difficult moments? Which friends have risked telling you the hard truth with grace and love, simply because they care about you? Which of your friends refuses to belittle or tear down others, even when those people are not around? Who holds you accountable for what you say you’re going to do? With whom do you feel absolutely safe? Your answers to these questions may reveal some of the people who would fit nicely into your circle of support,but if you come up short (which most people do), take heart. I’ll not only show you how to create your own circle of support, I’ll help you connect with others who are looking for someone just like you. Wouldn’t you love an opportunity to meet with a small group of people who are just as anxious and ready for change in their lives as you are? Using my website as a central location, I’ve created a place for people to find each other. The goal is to offer any individual who is ready to make changes the access to free, in-person meetings that provide mutual positive support. In January 2001, using my existing on-line community — the Life Makeover Community — I decided to start Life Makeover Groups around the world. These groups are designed to be a safe place where people can get the support they need to make the changes they’ve always wanted to make. Visit us at www.cherylrichardson.com, where you’ll find everything you need to start and run a successful Life Makeover Group. You’ll learn how to profile an ideal member, find new members to join you, locate places where you can hold your group meetings, and the best guidelines for how to run a successful meeting. If you’d rather join an existing group, we have an on-line database of open groups in search of new members. If you don’t own a computer, simply visit your local library, log on to their computer, and print out the information you need. I’ve learned a lot about what makes for a successful group experience. Members who take their participation seriously and do what it takes to get their needs met have the most success. Some members prefer to form groups with people who share certain lifestyle issues or situations — moms with small children, business owners, or empty nesters. Others prefer to be part of a more diverse group. The size of the group is important too. Experience has shown that the most productive and effective groups have no more than 6 or 8 members. Since the intention is to create community and to stay in action, it’s important for your group to meet regularly. Weekly is best, biweekly is next to best, and monthly works well when you buddy up with someone you can check in with by phone every week. Commitment is the key to success. If you decide to start a group, have members make a commitment to attend for at least three months, and schedule these meetings in advance to make planning easy and to demonstrate your commitment to the group. Review the entire book before doing the program. Choose a person (or persons) you can trust, and be sure that they are committed to the process of completing this book. Pick a regular time to meet (at least once a month) either in person or over the phone. Read one chapter (or section) at a time before getting together. Start the meeting by sharing your success. What did you learn about yourself? What action steps have you taken? Give each person a chance to brag! Spend time discussing the material that you’ve read in preparation for this meeting. Talk about your experience doing the exercises. Decide on the specific actions that you’ll each take before your next meeting. Ask for help. Use the last fifteen minutes of the meeting to request any support you might need—a check-in phone call, a special resource, or a helping hand. Buy yourself a journal or notebook to use in conjunction with this book. Each time you see the words Take Action! use this as a sign to take action immediately. Small steps make a big difference! Take your time doing the exercises and enjoy the process. If you feel overwhelmed by strong emotions, reach out to your group members for support. You might also seek the guidance of a good therapist (you’ll find more information about this on pages 57–58 in chapter one). You deserve to have great emotional support in place as you reclaim your power. Celebrate your success! Don’t wait to complete the book (or a chapter) before you do something special to acknowledge your progress. Reward is the best motivation of all. As you complete an exercise, you might schedule dinner with a good friend, buy yourself a small gift, or enjoy some down time. Whether you’ve created your circle of support or have decided to go through the program on your own, you’re ready for the first step. Let’s get started! Please note that Hay House, Inc. fulfills our store orders * and uses UPS for shipping. If the cost seems prohibitive, please contact (800) 654-5126 or email Customer Care so they may provide other options. *Please contact us for order inquiries about the Practice Building Workshop.